1 2 "Entrez Gene: CLIC4 chloride intracellular channel 4". ↑ Suginta W, Karoulias N, Aitken A, Ashley RH (October 2001). "Chloride intracellular channel protein CLIC4 (p64H1) binds directly to brain dynamin I in a complex containing actin, tubulin and 14-3-3 isoforms". Biochem. J. 359 (Pt1): 55–64. doi:10.1042/0264-6021:3590055. PMC 1222121 . PMID 11563969. Berryman M, Bretscher A (2000). "Identification of a Novel Member of the Chloride Intracellular Channel Gene Family (CLIC5) That Associates with the Actin Cytoskeleton of Placental Microvilli". Mol. Biol. Cell. 11 (5): 1509–21. doi:10.1091/mbc.11.5.1509. PMC 14863 . PMID 10793131. Berryman MA, Goldenring JR (2004). "CLIC4 is enriched at cell-cell junctions and colocalizes with AKAP350 at the centrosome and midbody of cultured mammalian cells". Cell Motil. Cytoskeleton. 56 (3): 159–72. doi:10.1002/cm.10141. PMID 14569596. Bohman S, Matsumoto T, Suh K, et al. (2006). "Proteomic analysis of vascular endothelial growth factor-induced endothelial cell differentiation reveals a role for chloride intracellular channel 4 (CLIC4) in tubular morphogenesis". J. Biol. Chem. 280 (51): 42397–404. doi:10.1074/jbc.M506724200. PMID 16239224. Duncan RR, Westwood PK, Boyd A, Ashley RH (1997). "Rat brain p64H1, expression of a new member of the p64 chloride channel protein family in endoplasmic reticulum". J. Biol. Chem. 272 (38): 23880–6. doi:10.1074/jbc.272.38.23880. PMID 9295337. Qian Z, Okuhara D, Abe MK, Rosner MR (1999). "Molecular cloning and characterization of a mitogen-activated protein kinase-associated intracellular chloride channel". J. Biol. Chem. 274 (3): 1621–7. doi:10.1074/jbc.274.3.1621. PMID 9880541. Rønnov-Jessen L, Villadsen R, Edwards JC, Petersen OW (2002). "Differential Expression of a Chloride Intracellular Channel Gene, CLIC4, in Transforming Growth Factor-β1-Mediated Conversion of Fibroblasts to Myofibroblasts". Am. J. Pathol. 161 (2): 471–80. doi:10.1016/S0002-9440(10)64203-4. PMC 1850723 . PMID 12163372. Shiio Y, Suh KS, Lee H, et al. (2006). "Quantitative proteomic analysis of myc-induced apoptosis: a direct role for Myc induction of the mitochondrial chloride ion channel, mtCLIC/CLIC4". J. Biol. Chem. 281 (5): 2750–6. doi:10.1074/jbc.M509349200. PMID 16316993. Singh H, Ashley RH (2007). "CLIC4 (p64H1) and its putative transmembrane domain form poorly selective, redox-regulated ion channels". Mol. Memb. Biol. 24 (1): 41–52. doi:10.1080/09687860600927907. PMID 17453412. Suginta W, Karoulias N, Aitken A, Ashley RH (2003). 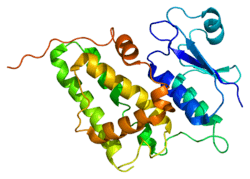 "Chloride intracellular channel protein CLIC4 (p64H1) binds directly to brain dynamin I in a complex containing actin, tubulin and 14-3-3 isoforms". Biochem. J. 359 (Pt 1): 55–64. doi:10.1042/0264-6021:3590055. PMC 1222121 . PMID 11563969. Valenzuela SM, Martin DK, Por SB, et al. (1997). "Molecular cloning and expression of a chloride ion channel of cell nuclei". J. Biol. Chem. 272 (19): 12575–82. doi:10.1074/jbc.272.19.12575. PMID 9139710.